Beautifully engraved certificate from the Municipal Utilities Company issued in 1907-14. The company was incorporated in New Jersey. This historic document was printed by the Security Banknote Company and has an ornate border around it. This item is hand signed by the Company’s President and Treasurer and is over 88 years old. The company was in business to acquire and operate established public utilites. 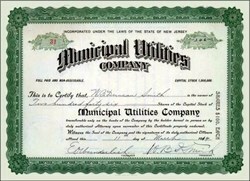 Acquired 1st mortgage bonds of the Hanover Gas Company, Willim,gton N.C. Sewerage Company, Opelika Alabama Sewer Company and the Hanover Pennsylvania Sewer Company. The company's directors included E. O. Wunderlich, W.B.D. Smith, and George H. B. Martin.